Now enjoy video editing by simply touching the screen. Enjoy using your fingers directly on your video, picture, and music with your friends and family. LoiLoTouch editing is extremely simple available for beginners. Barely no rendering and may use full touch features with Windows® 7 and multi touch compatible devices. Full HD, mobile, digital camera, video camera, mp3, images, you name it! Mix them all together and output them into various file formats, devices (iPod, DVD, etc), or go onto one click YouTube upload and share! Batch encoding also possible. Scribble and stamp away directly on your videos or even create animation with still images. Add various effects with a drawing like motion made easy and fun for anyone. Extreme 10X output made possible with NVIDIA® CUDA™ technology that enables GPU to take command for ultra fast video encode. 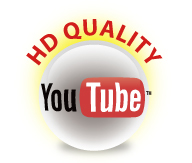 After editing your HD movie, upload your movie onto YouTube and share you movie with people all over the world. Download and enjoy our free 30 day trial! *1 After the 30 day trial has ended, the software will become the Free version of LoiLoScope. *2 Windows® 7 Home Premium (or higher) and touch screen monitor required.